Lisa Martin from Greenville National Bank presents check to Gathering at Garst committee member Katie Gabbard. GREENVILLE – The Gathering at Garst returns to the grounds of Garst Museum on July 28-29. The event continues to grow and attract visitors from near and far. Support from sponsors like Greenville National Bank helps make it possible to bring this quality event to Greenville. “The expenses involved in staging the Gathering at Garst are many. Without sponsorships, we would have to charge admission to defray these expenses,” Gathering chairperson Jenny Clark said. 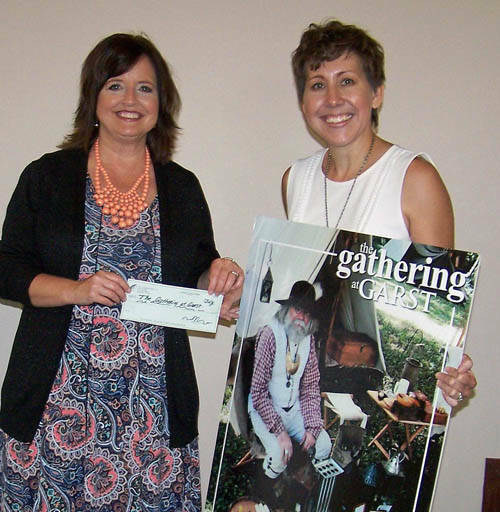 “We are grateful for the financial assistance we receive from Greenville National Bank that helps to make the Gathering at Garst a favorite summer festival,” Clark said. The Garst Museum is located at 205 N. Broadway, Greenville. For more information, call 937-548-5250, email info@gatheringatgarst.com or visit www.gatheringatgarst.com.